So HAPPY the weekend is here! Do you have any big plans for this weekend? I don’t as of yet, but I’m sure I’ll come up with something. I never told you about last Saturday and I’m hoping for an instant replay this Saturday, hint, hint Husband! This past Saturday my Husband asked if I wanted to do something, I told him ok. Then he told me to decide. I hate that! I get so tired of making all of the plans, so I told him “no”, you come up with something. He was not thrilled about that, so we hopped in his car and drove around the Bay Area. I asked where are we going? And he wouldn’t say. We ended up at the Bart station, which is the Bay Area Subway. We hopped on the Bart and off to San Francisco we went. It was a gorgeous day out! No coat required. We walked around the water and since the tulip festival going on, it was packed with people on the pier. We decided to get away from the crowd and head down a random side street. We never walked through the city off the beaten path before. We ended up in North Beach, which is a tiny community full of Italian Restaurants. I heard the best in the area! But did we end up with Italian for dinner? Nope! We found a dive, little restaurant with about 10 stools at the counter. This was a cheese steak shop! He said, let eat here! What? We walked the whole city, well it seemed like the whole city, to get cheese steak! I’m in! I had the best chicken cheese steak I have ever had! The bread was soft and the chicken was perfect! I topped my sandwich with Buffalo Wing Sauce! Oh man was it good!! The restaurant was wonderful and for a small place, it certainly got a lot of business. I can see why! We enjoyed our sandwich and headed back to the Bart. Well we had no clue where the Bart was, so kept walking! Found a Starbucks, had a coffee and found the Bart! It was such a nice, random fun day! I can’t believe we went to the city, just to walk for a couple of hours and get a sandwich It was perfect!! So crossing fingers to do that again, just hope we can find that restaurant again! I’m craving that sandwich! Today I have for you another Friday chicken dish. 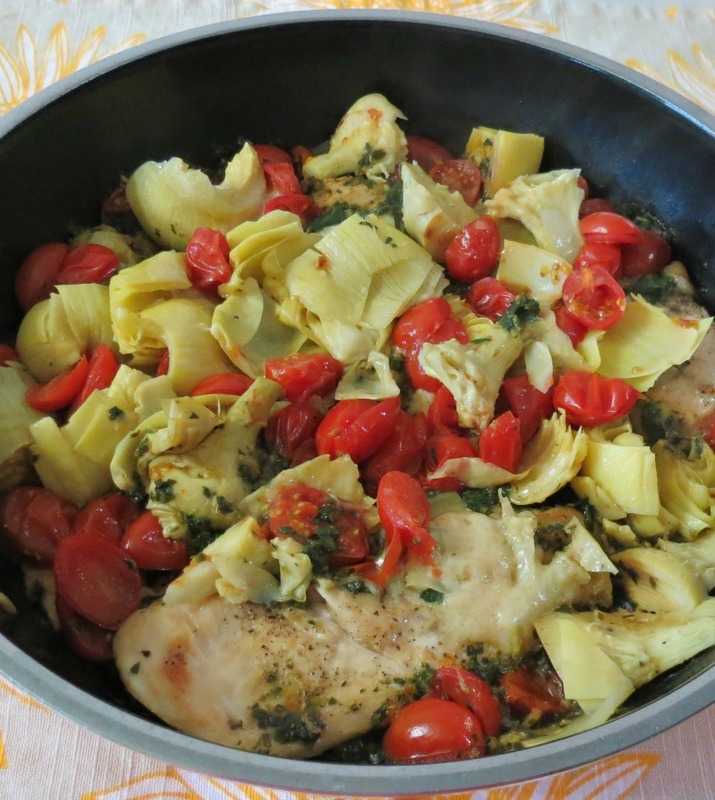 This is my Chicken with Spinach Pesto, Artichokes and Tomatoes. This chicken is quick and easy to make and loaded with a ton of flavor. There are so many ways with this dish too! I used spinach to make a pesto, but basil would be wonderful too! I would have done that, but Hubby doesn’t like basil and come to find out he doesn’t like tomatoes and chicken together! What?? After all these years, I learned something new. 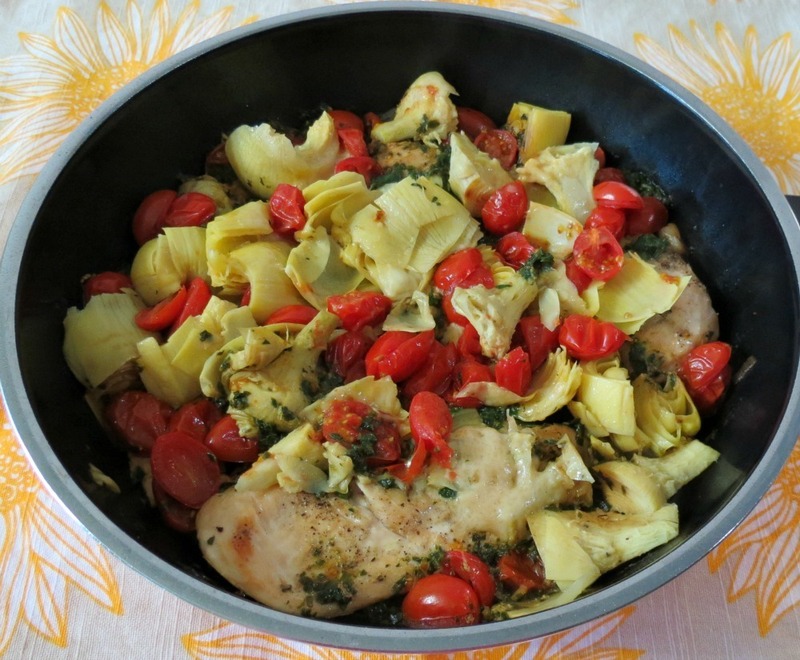 How can you not like chicken and tomatoes together? Well he got tomatoes! Lots of fresh cherry tomatoes! I sautéed the chicken in large pieces but you could also dice it up instead. It’s whatever you like. We had this dish as a stand alone dish, but it would be fabulous on pasta or in a sandwich!! Yummy! Also, if you don’t want to make pesto, you could use pre-made pesto too! But with my pesto, I didn’t use olive oil to make it. I used chicken broth. The pesto is not creamy, it was more of a finely chopped spinach. I wanted it that way because I knew that I would get a ton of flavor from the chicken broth that I sautéed the vegetables and chicken in. The whole dish took maybe 20 minutes to make! Makes for a healthy, great weeknight meal. I am happy to report that I do have some leftovers, so I’ll be having this for my lunch. I was just thinking, that a nice crusty bread would be great with this dish too!! I am so loving this chicken. It’s moist, full of flavor but not over bearing with spices. I like spices, but if you’re a frequent reader, you know my Husband doesn’t care for them. I honestly don’t know where he came from? He doesn’t realize it, but I do really try to appeal to what he would like too! That’s why I give you suggestions on other ways I would go with the same dish! Like adding basil to this one!! I also added some dried pepper flakes to my plate. Love my peppers! Oh and a drizzle of balsamic glaze just adds another layer of flavor to this tasty dish! 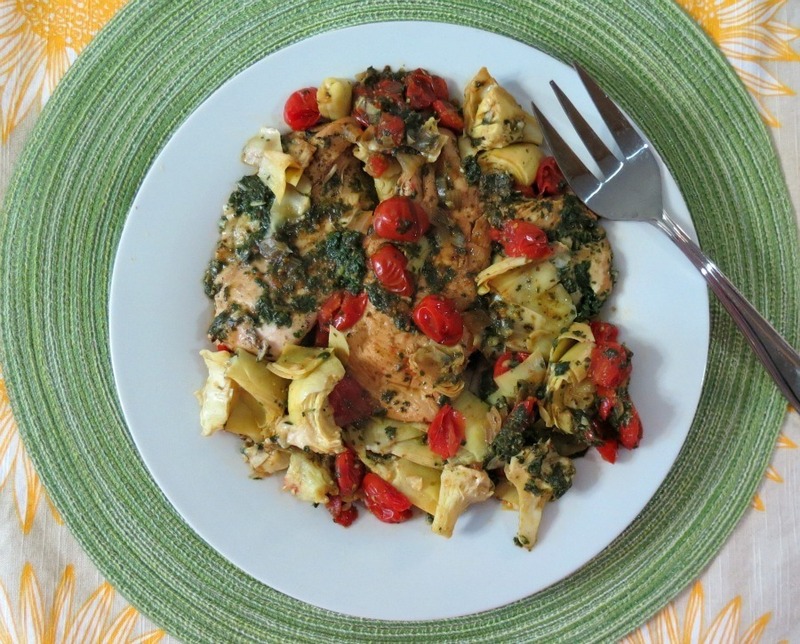 A healthy, flavorful, moist chicken dish made with spinach pesto, tomatoes, artichokes and topped with Parmesan cheese. In a food processor add spinach, garlic and chicken broth. Process until it forms into small bits. Your not looking for creamy. Set aside until ready to use. 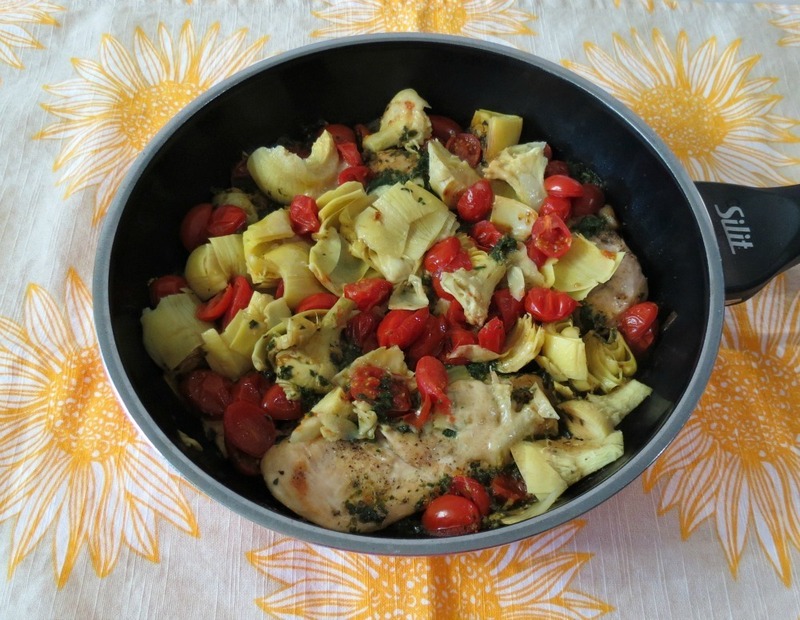 In a large skillet, sear the chicken on both sides, but don't cook all the way through. Set chicken a side. In the same skillet add olive oil and onion, saute until lightly softened; about 3 minutes. Be sure to pick up the chicken bits left in the pan. 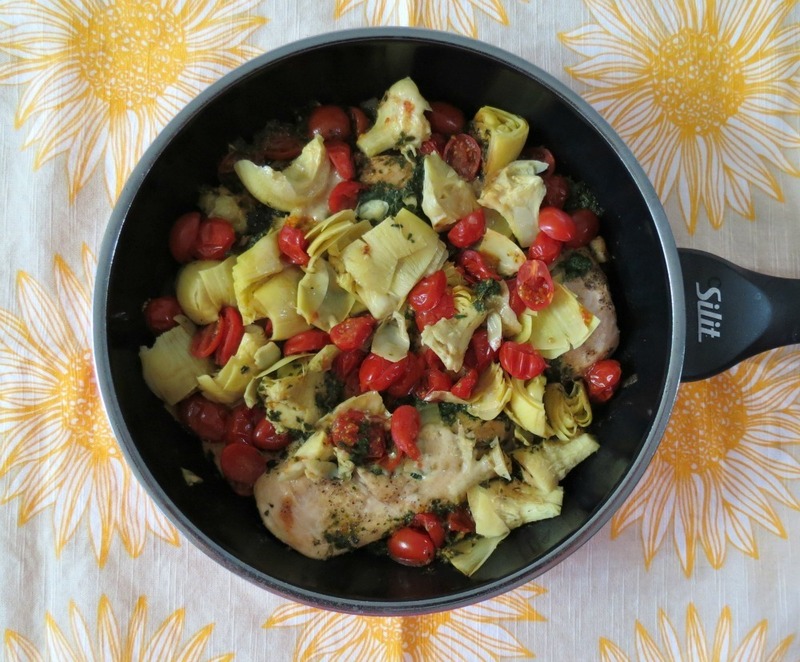 In the same skillet with the onion, add chicken broth, chicken, tomatoes, artichokes and spinach pesto. Top with Parmesan Cheese. Cover with a lid and cook until vegetables are soft and chicken is cooked all the way through; about 7 minutes. Place chicken on a plate, top with vegetables and spoon sauce from the pan over the top. You can also add a little bit of balsamic glaze for some extra fun flavor! This is a gorgeous meal! Seems like something we could enjoy all the time in our home. Thanks and have a super duper weekend!!! Thank you! I love this dish, it’s so versatile and full of flavor! Have a nice weekend! I just bought a bag of frozen artichoke hearts already chopped up from Trader Joe’s, do you think it would matter if I used frozen ones instead of ones from a can? Great idea to make a spinach pesto YUMMMM! I love me some Parmagiano Regginno! This was delicious! I made it a couple of nights ago. Thank you for the wonderful recipe! I found this on Pinterest today and made this tonight. It was delicious! I just threw the spinach in the pan instead of making it into the pesto and it turned out fine. My husband, 11 year old and 2 year old all liked it! Yay! This will go in our rotation!